Ok, I have to say that I didn't enjoy Season 2 quite as much as I did Season 1. I think a lot of it has to do with a changing dynamic on the show. A lot of it has to do with Kirk and I plan to write about this phenomenon in a later post. -This is the episode that started all the Pon Farr mania. Aside from the awesome score and the epic fight scene on Vulcan, this episode has some real heart. The core of Spock's friendship with both Kirk and McCoy is here as well as some great stuff about Spock's inner conflict. A truly classic episode. Stand Out Line: They are not outworlders, they are my friends. -Obviously, this one is totally iconic. Both DS9 and Enterprise pay homage to his episode and it made a huge impact on our pop culture in general. In many ways, this episode reminds me a lot of "The Naked Time." Both are, on the surface, fun romps but they each have surprising, deeper elements. Stand Out Line: You are a man of integrity in both universes, Mister Spock. 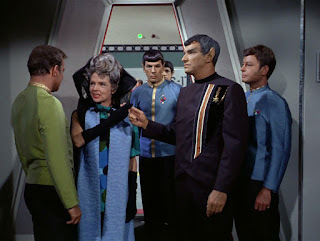 -Really, you can't make a go at Star Trek without getting familiar with this episode. It's such a huge part of Trek. There's even a little tribble in 2009's Star Trek. It's a fun episode with legitimate comedy and the Spock, Kirk, McCoy dynamic is great. Also, Scotty is amazing in this one! Stand Out Line: Storage compartment? Storage compartment? -Ok, I recommend this one based solely on Star Trek's obsession with obsession. Kirk goes full-Ahab in this episode. Themes in this story obviously return in Wrath of Khan and it's interesting to see those beginnings play out here. It's also nice to think that the reason Kirk gets the better of Khan is that he learned his important lessons about obsession here. Stand Out Line: Crazy way to travel! Sending a man's molecules all over the universe! -This story actually served as a backdoor pilot for a series wherein Gary Seven would spend episodes fighting crime/solving cases with the aid of his kitty, his Blossom-esque secretary, and his sonic screwdriver servo. NBC ultimately rejected the series but I think that's a real shame. I feel like Gary Seven could've been a great American SciFi show. Stand Out Line: That, Miss Lincoln, is simply my cat. "Journey To Babel" features Spock's parents. His relationship with them is pretty complicated and, as this strange family dynamic unfolds, it's pretty captivating. 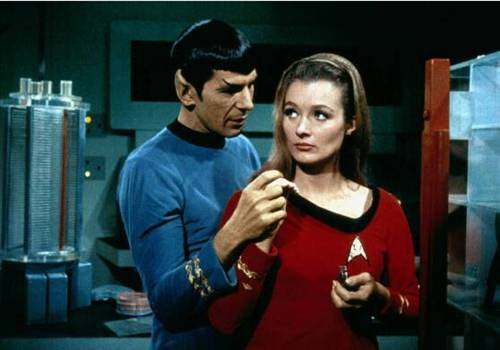 "Return To Tomorrow" is totally worth watching just to see what a knock-your-socks-off stunner Dr. Pulaski was in 1968. Seriously. I don't know why they played down her obvious old-hollywood glamour when she was Pulaski. She has SO much charisma in this episode (and in "Is There No Truth In Beauty") that it just doesn't even seem like the same person. It's like some kind of cruel, backwards magic trick.